Working with local stakeholders, we are developing a series of ' Alternative Futures ' landscape assessments for Gray's Harbor that combine current state-of-the-art predictions of possible climate changes impacts on this coastal community, biophysically-based models of flooding, erosion, and similar coastal processes, projections of human population growth and development associated with future growth, stakeholder-developed management policies guiding development pattern, zoning and response to natural hazards to better understand the possibilities and consequences of alternative managment strategies on a variety of community impacts, now and into the future. 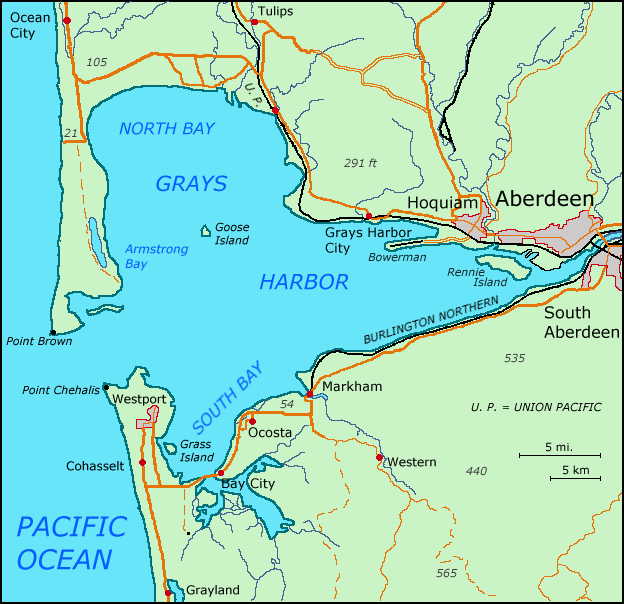 We are constructing a new coastal Knowledge-to-Action Network (KTAN) in Grays Harbor County, involving two simultaneous activities: (i) stakeholder engagement to begin defining the problems, understanding the decision space, and gathering data, and (ii) developing the models and datasets used to project alternatve future scenarios. The risk evaluation will describe in relatively fine spatial detail the climate-related hazards to both natural and built systems. We are incorporating sub-regional estimates of vertical land motion along the coast with changing storm surge and sea level in response to climate variability. This information will be used as input to model estimates of extreme Total Water Levels (TWLs) described below. Sub-regional estimates of alongshore changes in land surface elevation will be developed for the Washington outer coast for the first time. We are evaluating relative sea level rise (RSLR) rates from tide gauges and comparing these with uplift rates measured at GPS stations along the coast. These estimates are being combined with changes in regional (“eustatic”) sea level to produce sub-regional projections of sea level rise for the Washington outer coast. In parallel with this work, we will evaluate regional climate model projections (e.g. Mote et al. 2014) of surface pressure and winds associated with coastal storm surge, and examine the relationship between year-to-year fluctuations in sea level and large-scale patterns of variability such as El Nino and the Pacific Decadal Oscillation.